Genuinely among the hit lists for Berlin’s cleanest and most beautiful lakes, the Schlachtensee in Berlin offers you a perfect summer’s swim as well as an amazing trail to take a long walk on in spring, autumn and winter. The flair is very international, as many young people from all over the world like to come here and enjoy themselves in the sun, or ordering a couple of brews in the nicely located restaurant “Fischerhütte”, which overviews the lake. Still, the Schlachtensee is a very quiet and pristine place, with the majestic forest Grunewald surrounding it. It is frequented by many joggers, as a pathway leads right around the lake. 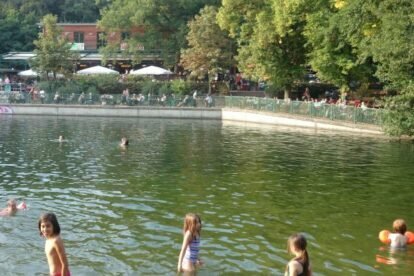 Oh, and it has a “little sister”, the Krumme Lanke, another lake just right across the street. If you want to forget about the noises of the city, the beautiful district of Zehlendorf, where the Schlachtensee resides, is just your place to be. Good news: The “Fischerhütte” is just a few steps away and always a good choice if you fancy a beverage, a snack or even an entire meal. You probably won’t find a place to sip a cold one with a view more amazing than here.